Things have been rough for JCPenney, there’s no doubt about it. Just recently it got ditched by Caribou Coffee and had to promise not to sell Martha Stewart designs it’d already ordered because of a fight with Macy’s. It seems the retailer knows it, as the company admitted in its annual report that its resurgence “may take longer than expected,” and also that its efforts to remake itself might not even work. In a document filed with the Securities and Exchange Commission on Wednesday (via the Los Angeles Times) it sounds as if the department store is shaking in its boots a wee bit. “There is no assurance that we will be able to successfully implement our strategic initiatives,” J.C. Penney wrote in the report. Chief Executive Ron Johnson has had a tough time since he took over, what with the legal battles the company is involved in with Macy’s, a switcharound on offering sales that confused customers and a decline in sales. 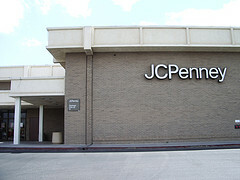 Its credit rating has been downgraded as the company implemented “changes in our pricing strategy, corporate branding, marketing, store layout and merchandise assortments,” JCPenney wrote in the report. A few things JCPenney notes as out of its control — highly competitive industry (which industries aren’t? ), unemployment rates and economic factors. Beleaguered. The word we are constantly searching for here is beleaguered.